I may have mentioned before that I was a picky eater as a kid. Until college, my diet consisted mostly of carrots and turkey sandwiches on wheat bread. Like most kids, I had very strong opinions about certain foods that would never (never) enter my mouth. I couldn’t tell you where these strong opinions came from. They were certainly not based on taste. Because I knew with the utmost certainty that something dreadful would happen if I ate that. As you might imagine, a food labeled “fungi” fell into this category. And I may or may not have pitched a legendary fit over a certain mushroom spaghetti sauce that went down in the annals of my childhood. And here I am 20+ years later eating, cooking and telling you to try nothing other than… mushrooms. Oh the irony. I’m not sure exactly what turned me on to mushrooms, but now they’re a regular staple of my grocery list. With some dark leafy greens and a little onion, you’ve got one of the quickest and healthiest weeknight meals you can make. Mushrooms are one of the most powerful healing foods on the planet. They’re a staple of Chinese medicine and have been used for thousands of years to treat everything from viruses to tumors. There are more than 200 varieties used medicinally with different powers and properties. But even the most common of mushrooms will do your body good. 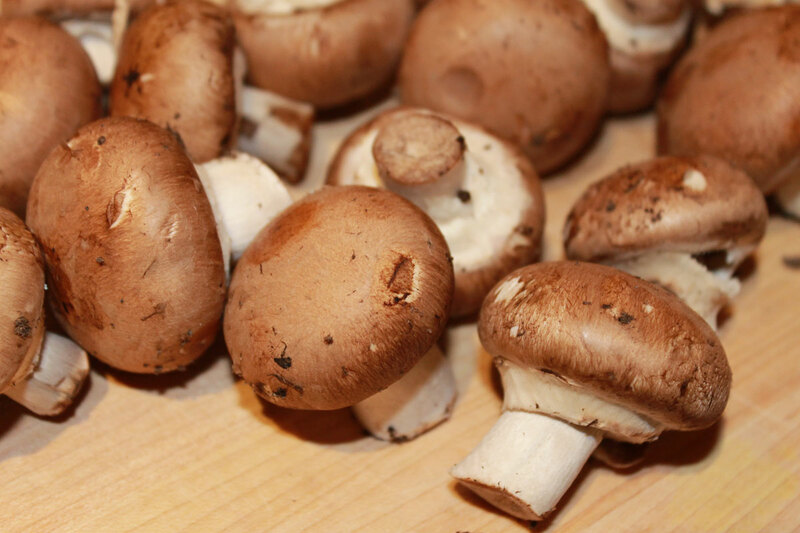 Generally, mushrooms are natural immune boosters and also work in the body to help regulate inflammation. I’m talking about the kind of inflammation that can exist and linger at low levels in the body and contribute to all sorts of diseases, like heart disease and Alzheimer’s. We’ve also learned that mushrooms help balance the level of estrogen in the body, essentially helping to prevent certain estrogen-related cancers, like breast cancer. In the world we live in today, where we come into contact with estrogens regularly from plastic bottles and containers, and added soy in so many foods, mushrooms work to block it. They’re also high in vitamins and minerals that are critical to cell and immune function – selenium, riboflavin, niacin, potassium, phosphorus, zinc and manganese. Superpowers aside, mushrooms are incredibly flavorful and add a richness to whatever it is that you’re cooking – like this soup, and I’m sure too that spaghetti sauce I turned my nose up at when I was five. In a medium-sized pot, bring 2 cups of water to a boil. Add a little salt and 1 cup of rice. Cover, reduce heat, and simmer until all of the water has been absorbed, 30 to 35 minutes. Meanwhile, in a large pot heat the oil over medium heat. Add the garlic and onions, ½ teaspoon salt, and ¼ teaspoon pepper. Saute until the onions are translucent and soft, 5 to 7 minutes. Add the carrot and celery and cook, covered, for 6 minutes more. Add the mushrooms, increase heat to medium-high, and cook, covered, until they release their juices, about 4 minutes. Add the broth, bay leaves, and thyme and simmer, uncovered, for 10 minutes. Stir in the cooked rice; remove and discard the bay leaves. If desired, season with additional salt and pepper. Next postHealthy? Super Bowl? Oh ya. This isn’t the best way to do this, since it uses salty processed foods, but I have started eating more canned soups, from chicken-and-rice to clam chowder. And I also have been cooking the boil-in-bag white rice, and adding the little bottles of sliced mushrooms. I know, I know … I need to switch over to fresh unprocessed and unsalted ingredients.